When God created man, He did not create him by a direct order, as He did with the rest of the creation, we hear the Lord commanding it, as in the case of light, for example” Then God said, “Let there be light”; and there was light” ( Genesis 1:3), as for man, the Lord said “Let Us make man in Our image, according to Our likeness; let them have dominion over the fish of the sea, over the birds of the air, and over the cattle, over all the earth and over every creeping thing that creeps on the earth.” So God created man in His own image; in the image of God He created him; male and female He created them” ( Genesis 1:26-27). And the Lord created man like this” And the Lord God formed man of the dust of the ground, and breathed into his nostrils the breath of life; and man became a living being” ( Genesis 2:7). This is the first manifestation of God in Adam the man who was made from the dust of the earth. The Lord made him in His image and gave him the breath of life, giving him, Eve and all mankind the power over His creation” Then God blessed them, and God said to them, “Be fruitful and multiply; fill the earth and subdue it; have dominion over the fish of the sea, over the birds of the air, and over every living thing that moves on the earth.” ( Genesis 1:28). The Lord has loved Adam greatly, and saw that what He has done was good, therefore do not be surprised when you read in the genealogy of Christ as written in the Gospel of saint Luke”…. the son of Enosh, the son of Seth, the son of Adam, the son of God” ( Genesis 3:38). But man fell in the first Adam when he transgressed the commandment of God and was attracted to the dust in him. Eating from the tree of knowledge of good and evil, thus bringing the curse to the earth from which he was brought, tainting the image and separating himself from the Divine likeness” Yes, in the way of Your judgments, O Lord, we have waited for You; The desire of our soul is for Your name And for the remembrance of You. With my soul I have desired You in the night, Yes, by my spirit within me I will seek You early; For when Your judgments are in the earth, The inhabitants of the world will learn righteousness” ( Isaiah 26:8-9). Also in Ecclesiastes we read” He has made everything beautiful in its time. Also He has put eternity in their hearts, except that no one can find out the work that God does from beginning to end” ( Ecclesiastes 3:11). And to open its seals; For You were slain, And have redeemed us to God by Your blood Out of every tribe and tongue and people and nation” ( Revelation 5:9). How glorious is Your incarnation O Son of God, You came down to our humbleness to honor us and to our death to raise us, returning to Your Father, and we in You a new creation not from dust like the first Adam but newly born from water and Spirit, making us ” kings and priests to His God and Father, to Him be glory and dominion forever and ever. Amen” ( Revelation 1:6). 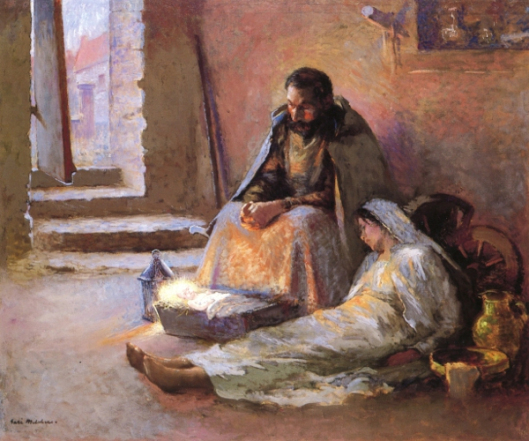 The birth of Christ honors and glorifies God the Father Who has shown His Divine love by the incarnation of His Son and His death on the Cross, therefore there’s no wonder that we hear from the angels to the shepherds” Glory to God in the highest, And on earth peace, goodwill toward men!” ( Luke 2:14). Goodwill to people also because Christ joined God and the human race in peace and also peace for people with one another, whoever wears Christ acquires God’s love to all. Truly Saint Paul said” And without controversy great is the mystery of godliness: God was manifested in the flesh” ( 1 Timothy 3:16). From here, let us honor our bodies, which have been sanctified by Baptism and Meyroun. God has honored our humanity by the incarnation of His Son, therefore listen to the Word” I beseech you therefore, brethren, by the mercies of God, that you present your bodies a living sacrifice, holy, acceptable to God, which is your reasonable service” ( Romans 12:1). Praying from the heart and mind is a sacrifice in which the body participates, and fasting in humility before God is a sacred offering in which the body partakes, as well as worshipping with the spirit and truth is manifested and achieved by kneeling, placing your forehead on the ground and chest gourd, this and all kinds of spiritual and physical worship. ” Foods for the stomach and the stomach for foods, but God will destroy both it and them. Now the body is not for sexual immorality but for the Lord, and the Lord for the body” ( 1 Corinthians 6:13). What great blessings that we have taken by the incarnation of the Word of God. Yes, Christmas is the start of joy, salvation, freedom and the return of human race to the likeness of God and His image in Christ and forever.